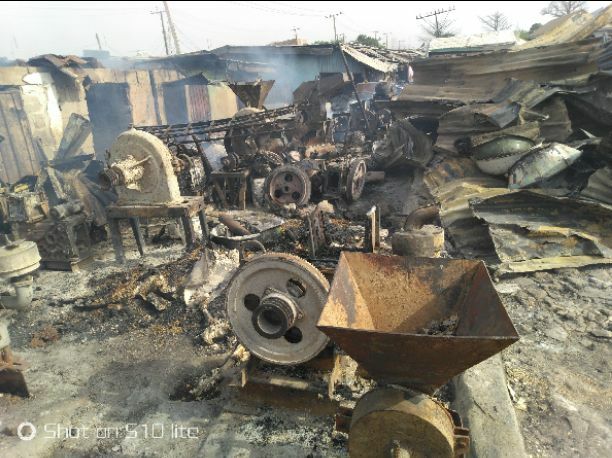 Traders of food stuff at Birni Kudu in the Bakin Dogo axis of Kaduna Central Market are counting their losses following a midnight fire which burned down several shops. As at 9am Wednesday, men of the fire brigade were sighed at the scene of the incident trying to extinguish the fire to prevent escalation. The fire was said to have began at around 2am while shop owners were at home, except for the guards, who alerted those they could. One shop owner, Aisha, who spoke in tears, said she and her mother lost several bags of food stuff to the fire. Though the official cause of the fire, as at the time of this report, is unknown, eyewitnesses attribute it to power surge from Kaduna Electric, the state electricity provider.